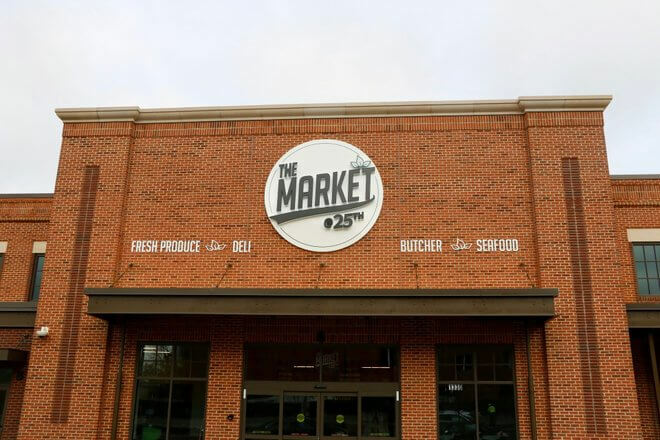 The new East End grocery store, The Market at 25th, is just weeks away from making its highly anticipated grand opening on Monday, April 29. The store will primarily service an area defined as a food desert for residents along the Richmond-Henrico County border, encompassing three of the city’s public housing projects and some of the neediest Richmond Public Schools. The goal is to provide a comfortable, approachable community store that celebrates the Church Hill neighborhood and East End and can serve as a central hub. “I think we’ve done a really nice job of that, hiring locals and giving local vendors an opportunity and also making this look and feel like a local store,” says developer and operator Norm Gold. Take a look at the inside of the store by clicking this link. I am so excited about this store! There should be a map link! I think this will be my new go to store…Farm Fresh has gotten us through but loving the history built into the store!! They really had to put churches on a pedestal with the aisle markings? Oh well, hopefully this place wont get trashed and everyone can enjoy it, though it does look like it has the potential to he pricey. I am so excited for this store to open! I love the dedicated neighborhood approach and the commitment to healthful foods. Yes Mark, the church is a large part of the African-American community. There is much history there. My hope is that this store reaches out to all and that it is a place where everyone can feel joy in shopping. Pollyanna-ish I know but this is a market that is needed in the area. The store looks great. Modern, well thought out on the inside and with a design flair for older architecture on the outside. I also like the idea of giving back to locals as well as helping to bring the community together. BUT… I do take away mixed feelings about their approach about Church Hill History. Everything shown in pictures and text, ONLY relates to the African-American community and that is not historically accurate. Jackson Ward was to the black community as Church Hill was to whites. Prior to the Civil War, Church Hill was the gathering place for the wealthy “white” population with many grand homes. It remained so for most of the early 20th century until the White Flight. To portray Church Hill as established and built only by black’s is flawed history. I saw no white faces in their timelines. I hope it’s handicapped accessible, for i use a power chair and live 4 blocks away, hopeing it has a pressure sensitive door.